MultiProxy is a multifunctional personal proxy server that protects your privacy while on the Internet as well as speeds up your downloads, especially if you are trying to get several files form overseas or from otherwise rather slow server. It can also completely hide your IP address by dynamically connecting to non-transparent anonymizing public proxy servers. You can also test a list of proxy servers and sort them by connection speed and level of anonimity. MultProxy listents on port 8088 by default, so you will need to configure your browser to connect to Internet via proxy server at address 127.0.0.1 (localhost) and port 8088. You can change the port number from options dialog box. If you want other computers on your LAN (without Internet access) to connect to Internet through MultiProxy, you need to enter the actual IP address of the computer where MultiProxy has been installed (instead of 127.0.0.1). You can find out the computer's IP address by running winipcfg.exe (via Start|Run from Windows taskbar, for example). 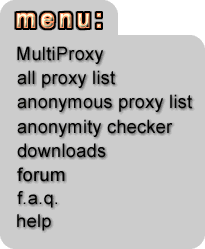 MultiProxy is Freeware -- you can use it as long as you want and you can share it with anybody you want. But only if it is for personal or non-commercial use! Thanks. Click here to download the latest version of MultiProxy. On this site you can also find a list of public anonymous proxy servers and all proxy server list as well.